Amazon yesterday announced its Echo connected smart speaker is now available to pre-order in the U.K. and Germany, signaling the end of a 14-month wait for the device to become available outside of the U.S.
For those unfamiliar with the device, the Echo's array of microphones lets users query voice-based assistant Alexa, who can be asked to do things like play music, read the news, use apps, check the weather, turn on the lights, set timers, and more. The Amazon Echo costs £150 in the UK and 180 Euros in Germany, while Amazon Prime members get a £50 or 50 Euros discount off the sale price if they pre-order today. The Echo ships on September 28 and October 26, respectively, and the device is available in black or white. The company also made good on Tuesday's deleted tweet and announced an "all-new" version of the Echo Dot, a smaller $49.99 speaker that allows existing Echo owners to extend the smart system around the house. The Echo Dot, originally launched in March of this year at the price of $89.99, also lets existing Echo owners connect up their entertainment system and use Alexa to control streaming music services. 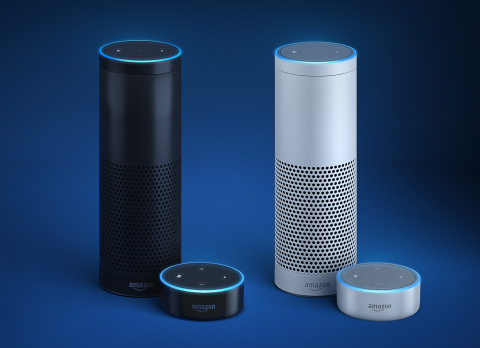 The new Dot includes a faster speech processor than the old one and feeds into its Echo Spatial Perception feature, which enables the device to identify which speaker is closest to the user when a query is put to it. Otherwise, design differences between the first- and second-generation Echo Dot are subtle: the new Dot is marginally smaller and lighter, with an identical diameter but a height of 1.3-inches, compared to 1.5-inches, and weighs 5.7 ounces versus 8.8 ounces. In addition, volume buttons have replaced the control slider on the top, and a 3.5mm audio cable is no longer included in the box. The device also comes with a 90 day warranty, as opposed to the original model's one-year warranty, and is likewise available in the U.K. and Germany. "I too could be something more, if Apple allowed me to be." -- says, Mac mini. Pre-ordered an Echo in white. Been more than happy with our current gen Fire TV for our none iTunes content and with arguably better app support (All4, ITV player, Prime content over and above our ATV NowTV & iPLayer support, not to mention YouTube). I'm also a longstanding Kindle (Paperwhite) fan and have a fair few Audible audiobooks (esp Bill Bryson reading his own books). For £99 I'm in with the Echo - will see how it holds up in the kitchen alongside the Sonos. If nothing else Audible and setting cooking timers (currently my 6s's job) will make it worth while. Having news headlines read to me over breakfast also appeals.